The Zurich Bog is a large, moderately acidic, wetland trapped between large drumlins in central New York State. Such wetlands were never common in this portion of the Great Lakes plain, but have become increasingly rare since European settlement due to drainage, filling, and pollution. Thus such a bog, particularly one of such size, is a rare treasure in this area. Owned by the Bergen Swamp Society, a conservation group, access is by permission only as this is not a public park. The Zurich Bog is a registered National Natural Landmark. Note the drumlins bounding the wetland area, and the small drumlin contained within the bog. Also, the lake to the north end, Mud Pond, is actually covered with a mat of vegetation, predominantly sedges, which can be traversed on foot, but at one's peril. It's like walking on a waterbed, one probably up to 100 feet deep. A bog is typically a Sphagnum-dominated wetland, highly acidic in nature, with little influence by calcium due to surface water or groundwater flow. A fen is a wetland heavily influenced by calcium, often through springs. 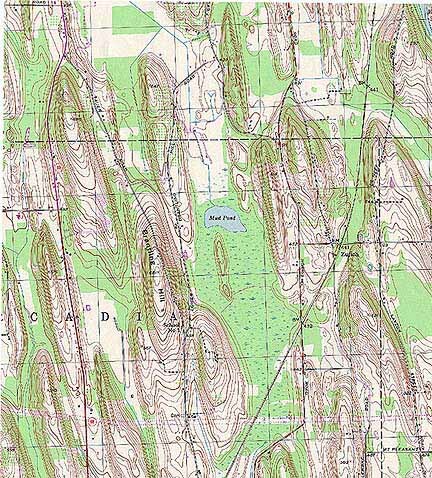 The surrounding drumlin hills consist of pulverized material from igneous rocks of the Canadian Shield to sandstone and limestone or dolomite, and the immediate area sits on top of the Lockport dolomite layer (the same bedrock layer that caps Niagara Falls). Furthermore, several of the wetlands in the area have marl layers deposited in their soil strata from the time that they were open, mildly alkaline lakes with calcium-depositing algae. Yet water inflow is currently quite low, reducing the buffering and oxidizing nature of the soil. Zurich bog could never be a strongly acidic bog, nor could it be a fen. It is, however, an interesting mix of both. The vegetation provides the evidence for this, such as the presence of two trees of different pH preferences, the calciphile Thuja occidentalis (northern white cedar) with the boreal acidic wetland tree Picea mariana (black spruce). Many examples of this sort of pH-based biodiversity exist here. The plant diversity of this bog is also influenced by the successional phases contained within. Large enough to contain several distinct habitats, this wetland has late successional bog forest along the margins and surrounding the island drumlin with red maple (Acer rubrum), common yew (Taxus canadensis), hemlock (Tsuga canadensis), black ash (Fraxinus nigra), yellow birch (Betula lenta), spicebush (Lindera benzoin), gold thread (Coptis groenlandica) and cinnamon fern (Osmunda cinamomea); early successional bog forest with tamarack (Larix laricina), black spruce, highbush blueberry (Vaccinium corymbosum), northern white cedar (Thuja occidentalis), and Sphagnum spp. ; open sphagnum bog several species of Sphagnum, leatherleaf (Chamaedaphne calyculata), Labrador tea (Ledum groenlandicum), purple pitcher plant (Sarracenia purpurea), narrow and round-leaved sundews (Drosera intermedia and D. rotundifolia), cranberry (Vaccinium oxycoccus), Scheuchzeria palustris, and several orchid species; and quaking sedge meadow/marsh/open pools with Scirpus spp., narrow-leaved cat tail (Typha angustifolia), reed grass (Phragmites australis), water lily (Nymphaea odorata), purple pitcher plant, narrow-leaved sundew, posion sumac (Toxicodendron vernix), wax myrtle (Myrica gale), and water willow (Decodon verticillatus). Even the isolated upland area on the island contains sizeable individuals of hemlock, black cherry (Prunus serotina), red oak (Quercus rubra), beech, white pine (Pinus strobus), tulip tree (Liriodendron tulipifera), sugar maple, and herbaceous species like white and red trillium (Trillium grandiflorum & T. erectum), false solomon's seal (Smilacina racemosa), grape fern (Botrychium virginianum), and indian cucumber root (Medeola virginiana). Upland forest surrounding the bog is at a much earlier successional stage due to easier access to logging, and some portions of the sphagnum bog have been historically mined for peat, both of which add to the diversity of the site. Finally, the diversity of the Zurich Bog is influenced by ancient relicts and recent arrivals. The temperate forest in the uplands and surrounding the bog, typical of most of central & western New York State, is of more recent origin, developing here from southern migrations over the last several thousand years due to glacial retreat and warming of the climate. In contrast, much of the wetland and bog forest flora is relictual from an earlier, colder period from relatively soon after glacial retreat. Such plants are typical of boreal and tundra conditions, like black spruce, tamarack, leather leaf, labrador tea, and cranberry. And the late-successional bog forest is typical of transition forests in the Adirondack Mountains, northern New England, the Northern Great Lakes, parts of southeastern Canada, and cooler parts of the Alleghany Plateau. Eventually, without further disturbance, all of this bog will become this type of forest. The grassy meadow with a pond at center is actually the quaking mat over Mud Pond. The low hill just to the right is the drumlin island in the bog. Note the large drumlins just beyond the meadow. This photo was taken from the top of another large drumlin, Brantling Hill.